In a paper for his Social Ideology and Early Modern Drama class, Nicholas Sanders argued that men portrayed in Renaissance literature often suffered especially miserable fates. In a paper for his creative non-fiction class, he wrote about the woman across the street re-imagined as a witch, and recounted the similarities between the history of Salem and his own town, Colonie, which was settled by the Shakers. And for a digital storytelling assignment, Nick compared managing a retail store to Milton’s notion of hell. Nick. who is an English major, has distinguished himself by going well beyond simply reading something to peeling back the layers to study what is behind a piece of writing. He has done so as well with his own writing, thinking hard about how what is happening in front of him might be reflected in history or in literature. With commencement just weeks away, Nick says he has benefited enormously from a richly varied collection of English classes that included Russian Literature, Digital Storytelling, Irish Drama, Satan as a Force in Literature, Urban Space in the Modern American Novel, Literary Journalism and Renaissance Drama. His motivation and diligence have paid off: Nick recently won the College’s senior writing award, which recognizes three pieces of submitted writing. 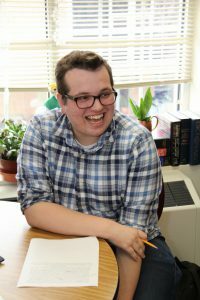 His academic excellence has also earned him a graduate assistantship at the University of Maine at Orono, where he will study for a master’s in English with a concentration in composition pedagogy. He hopes to pursue a doctorate, perhaps focused on critical theory and its intersection in compositional discourse. “I never win anything,” he joked of the Saint Rose writing award. “If you revise your work over and over, it makes a big difference. The article-length essay on men in Renaissance literature, for instance, took at least three months. As he develops his own scholarship Nick hopes one day to teach college writing and critical theory and to guide students as his Saint Rose professors have guided him. In particular he credits Barbara Ungar, Catherine Cavanaugh, Vaneeta Palecanda, David Morrow and David Rice for setting high standards. “Each professor’s advice seemed to grow on the advice I previously received,” he said. Nick also has stood out for his work in the College Writing Center, where he tutors as part of an English internship. He also continues to tutor at Fulton-Montgomery Community College, which he attended until transfering to Saint Rose as a junior. and he has even presented at regional peer tutoring conferences. A scholar who looks for roots in reality, he attributes his own ability and interests to his mother, Colleen Sanders, a Saint Rose alumna who runs the writing center at Fulton-Montgomery Community College. Colleen Sanders ’03 earned her master’s in English. She had some of the same professors Nick did – and then some.